Call for the most advanced nonsurgical techniques for treating carpal tunnel syndrome. Carpal tunnel syndrome occurs when the median nerve, which runs from the forearm into the hand, becomes pressed or squeezed at the wrist. The median nerve controls sensations to the palm side of the thumb and fingers (although not the little finger), as well as impulses to some small muscles in the hand that allow the fingers and thumb to move. The carpal tunnel - a narrow, rigid passageway of ligament and bones at the base of the hand - houses the median nerve and tendons. Sometimes, thickening from irritated tendons or other swelling narrows the tunnel and causes the median nerve to be compressed. The result may be pain, weakness, or numbness in the hand and wrist, radiating up the arm. 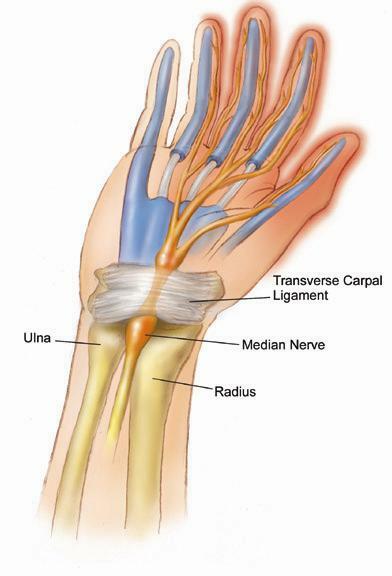 Although painful sensations may indicate other conditions, carpal tunnel syndrome is the most common and widely known of the entrapment neuropathies in which the body's peripheral nerves are compressed or traumatized. Symptoms usually start gradually, with frequent burning, tingling, or itching numbness in the palm of the hand and the fingers, especially the thumb and the index and middle fingers. Some carpal tunnel sufferers say their fingers feel useless and swollen, even though little or no swelling is apparent. The symptoms often first appear in one or both hands during the night, since many people sleep with flexed wrists. A person with carpal tunnel syndrome may wake up feeling the need to "shake out" the hand or wrist. As symptoms worsen, people might feel tingling during the day. Decreased grip strength may make it difficult to form a fist, grasp small objects, or perform other manual tasks. In chronic and/or untreated cases, the muscles at the base of the thumb may waste away. Some people are unable to tell between hot and cold by touch. Carpal Tunnel Syndrome describes the condition in which a major nerve in the wrist controlling the thumb, index and parts of the middle finger gets irritated or compressed causing pain, numbness and tingling or weakness. Is Your Carpal Tunnel Just Carpal Tunnel? structures in the nerves path from the neck to the fingers entrap the nerve along its course, that irritation can mimmick symptoms of carpal tunnel.The Chiropractic approach identifies the exact point or multiple points irritating the nerve, and treats those issues specifically. The risk of developing carpal tunnel syndrome is not confined to people in a single industry or job, but is especially common in those performing assembly line work - manufacturing, sewing, finishing, cleaning, and meat, poultry, or fish packing. In fact, carpal tunnel syndrome is three times more common among assemblers than among data-entry personnel. A 2001 study by the Mayo Clinic found heavy computer use (up to 7 hours a day) did not increase a person's risk of developing carpal tunnel syndrome.